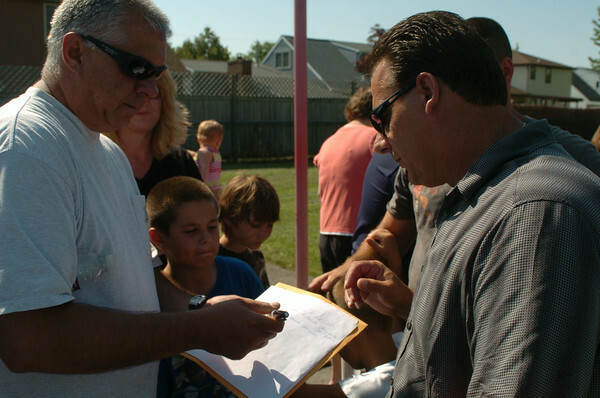 DAN CAPPELLAZZO/STAFF PHOTOGRAPHERNiagara Falls - Marine Drive resident Fred Zowacki signs up for a community committee with City of Niagara Falls Assistant DPW director John Caso at community gathering at Caravelle Park. Area residents complained of late night basketball and rowdy youths at the park prompting the city to take down the basketball nets. Residents and city officials met at the park to come up with a solution to the problem. Local officials and residents agreed to form a committee to fix the problems at the LaSalle area park.